Hello ! I have a Diplomatical gift to You, New Territory for Your People and Policy ! Great Day Dear Excellence ! 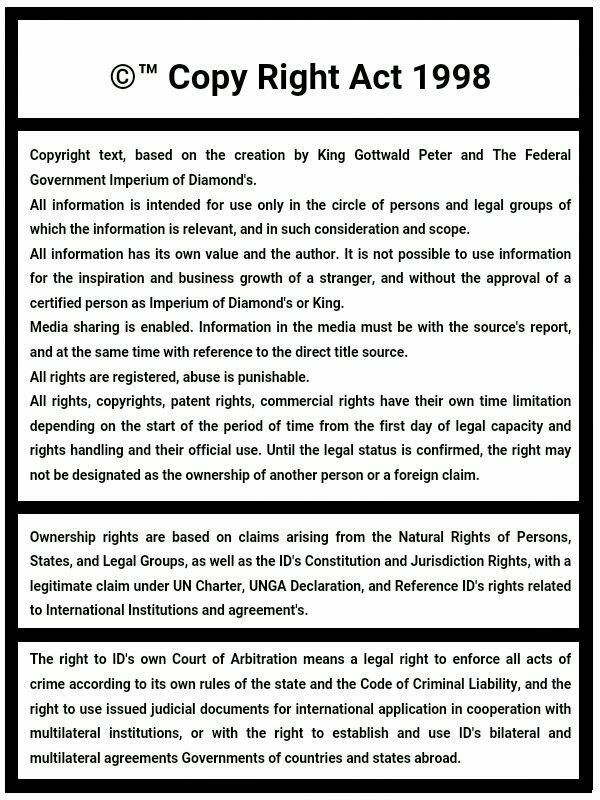 My name is King Gottwald Peter, I'am represent for new government country which have own territory de jure claimed according all International Right's & Political privileges in correction, and I today represent world-new and my own vision of unified world. I therefore invite all people and movements of Independence and separation, on a step of Global Progress, our partner step for our cooperative oportunity stand together and develop new global centralization of people which can actived most greater state in the history of the world. Global Independent People Centralisation, we can stand as the nation 1,500,000,000 people around the world, and our minimal level of army is 100,000,000 soldier's. Dear Excellence, if Your Party is interested for more inspiration for partnership, I am glad if I can send to You new invitation, where You can visit and study new information about our mission. Thank You Dear Excellence, I wish You all Sucess !! Follow new people, Follow The King !